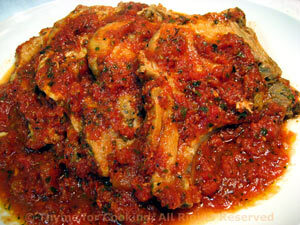 Italian Pork Chops, Thyme for Cooking easy, flavorful, main course. Just a few ingredients simmered together to produce moist, tender pork chops. The lemon adds a fresh taste to the tomatoes. Grate the lemon before cutting, using a lemon zester or the fine wholes on a grater. You only want the yellow, or zest, not the white, which is bitter. Lightly grate lemon all over to remove zest (yellow part of the peel only). You should end up with at least a tsp. Cut lemon in half and squeeze for juice. You should have about 2 tbs. Sauté pork chops until lightly browned, about 3 minutes per side. Add all remaining ingredients, including zest and juice. Cover, reduce heat to low, and simmer 30 minutes. Serve.